A purportedly official email sent out to Brazilian Apple Authorized Service Providers (AASPs) earlier this month appears to confirm a previous rumor that Apple is planning on performing iOS device repairs in-house, a change from the current policy of replacing the damaged model with a refurbished unit. While the information provided to AppleInsider is a photograph of a computer screen showing the email, and not the actual email itself, the text is in line with a previous rumor saying Apple would be making dramatic changes to its repair services later this year. The overhaul, however, was thought to be limited to brick-and-mortar Apple Stores. It should be noted that, due to the nature of the "leaked" correspondence, AppleInsider cannot vouch for its authenticity and provides the following for purposes of discussion only. 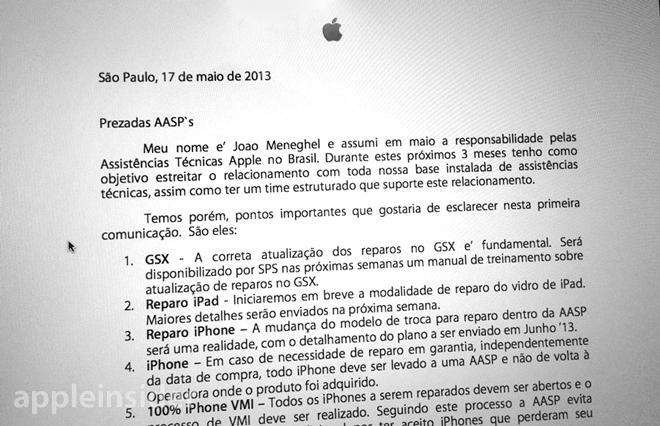 My name is John Meneghel, and in May I assumed responsibility for Apple Technical Assistance in Brazil. Over the next three months I aim to strengthen the relationship with our entire installed base of technicians, as well as having a structured team that supports this relationship. 1. GSX - The correct upgrade from basic repairs and GSX. Will be provided by SPS in coming weeks in a training manual updating of repairs GSX. 2. iPad Repair - We will soon begin to repair iPad glass. Further details will be sent next week. 3. iPhone Repair - The Changing Patterns of exchange for repair within AASP will be a reality, with details of the plan to be sent in June '13. 4. iPhone - In case of repair under warranty given independently of purchase, all iPhones should led to an AASP and not back to one carrier was bought. If true, the email's June 2013 start-by date provides the first evidence as to when Apple's rumored program will be instituted. Previously, the rollout was set for fall.